In case you missed it. Friend of the blog Brett Carter from RMIT university in Australia has another conversation article out with Delores Knipp from the University of Colorado. You can read it below or find it on The Conversation's website. And remember The Conversation is always looking for interesting articles. So if you have some interesting science, or something else to share, make sure to pass it by their editors! As technology becomes increasingly vital in our day-to-day lives, we are more susceptible to “space weather”. What begins with dark spots on the Sun’s surface, and magnetic field disruptions in the Sun’s atmosphere, can result in widespread technological disturbance. With our increasing reliance on telecommunications and other technologies, monitoring what happens in space has never been more important. During a solar flare, pulses of electromagnetic radiation are emitted into space, showering the solar system with intense radio waves, X-rays and ultraviolet radiation. At times, these flares are accompanied by solar material, in what is called a “coronal mass ejection”, or CME. These disturbances contribute to the variability in the near-Earth space environment. A lot of the technology on which we depend is susceptible to these disturbances. Satellites use radio waves to communicate, and thus are vulnerable to radio signal disruption, but so are more Earth-bound technologies – CMEs have been linked to the failure of some power grids and could impact high-speed railways. The first documented link between a CME and technology comes from 1841, when a telegraph system was affected by strong magnetic field fluctuations during a magnetic storm. “On the 18th of October, 1841, a very intense magnetic disturbance was recorded,” the journal Nature reported. The disturbance caused a train to be delayed by 16 minutes as “it was impossible to ascertain if the line was clear at Starcross”. The superintendent of Exeter station reported the next morning that “someone was playing tricks with the instruments, and would not let them work”, demonstrating how innocuous such events may appear. This event was less than 20 years before the largest known space weather event, the infamous Carrington geomagnetic storm in 1859, during which northern auroras were seen as far south as El Salvador in Central America. The 20th century also had its fair share of severe geomagnetic storms. Radio and telephone communications were widely disrupted during a May 1921 storm that saw the aurora borealis outshine Broadway in New York City. A telephone station in Sweden burned out, a New York telegraph operator claimed that “he was driven away from his instrument by a flare of flame which enveloped the switchboard and ignited the building”, and telegraph lines in France “seemed possessed by evil spirits”. The event even touched Australia, with the Argus reporting disruptions to telephone services between Melbourne, Sydney and Brisbane. Seventy-five years ago, on September 18-19, 1941, there was another great geomagnetic storm, which also led to aurora sightings in the skies across the middle latitudes of the United States. At the time, Europe was at war and the Allies were heavily dependent on the flow of supplies across the North Atlantic Ocean. The geomagnetic storm appeared to have influenced the North Atlantic battle theatre by causing disruptions to short-wave radio transmissions, as reported by Kapitänleutnant Eitel-Friedrich Kentrat on board German U-boat U-74, which was actively hunting in the area. The storm had negative consequences for the Allied supply ships on route from North America to England, who found themselves travelling on a night that had been rendered as “bright as day”, according to Kentrat. Throughout the night, a Canadian convoy was attacked by U-74 and HMCS Lévis was torpedoed and sunk. Eighteen people lost their lives and 40 were rescued. 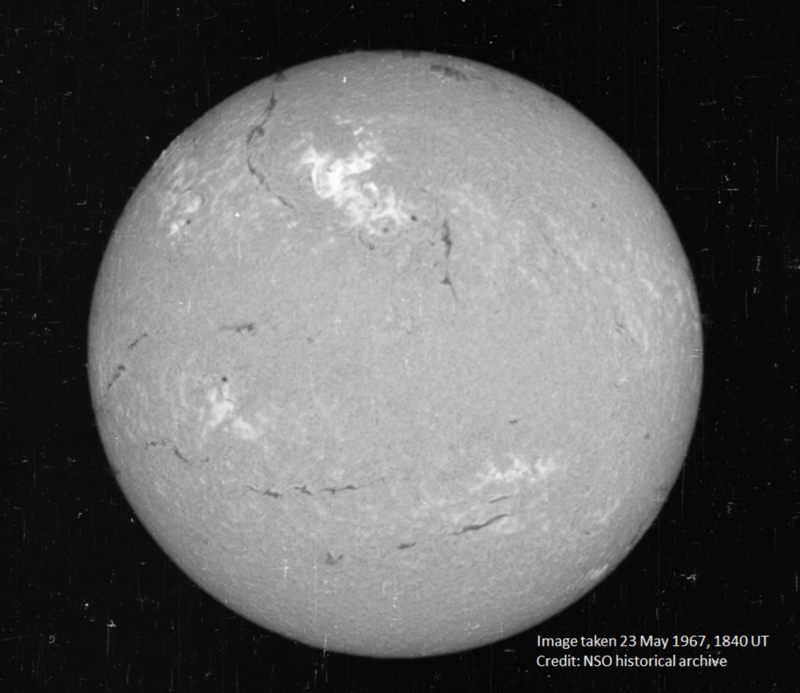 A great space weather storm in May 1967 began with a colossal solar radiation burst. Ultimately it produced a CME-driven, record-setting storm in Earth’s magnetic field (the magnetosphere) and upper atmosphere, including the ionosphere between 80km and 500km altitude. It currently stands as the eighth most intense storm since magnetic records began and one of the largest ever in the ionosphere. The intense solar radiation burst was accompanied by several additional flares and other space-based phenomena that negatively impacted radio surveillance and communications across North America. One of these systems was responsible for detecting incoming ballistic missiles over the polar region, providing a 15-minute warning to Canada, the United States and Britain. To the uninformed, the event easily have been misinterpreted as system radio jamming, potentially an act of war or an indication of an impending attack. This disturbance came during a tense time in the Cold War. The United States and Soviet Union were actively challenging each other for the top position as the dominant global superpower. The Vietnam War was ramping up and tensions were building in the Middle East, leading eventually to the Six-Day War in June 1967. Crisis was averted during the Cold War largely because of the space monitoring that was already in place. The US Air Force had established solar observatories after the Second World War, which allowed space weather forecasters and the US Department of Defense to understand that the “jamming” was from a natural source. Nowadays, as we become even more dependent on communications technology, an extreme space weather event could have even more severe consequences. Therefore, as technology advances, so must our knowledge of the near-Earth space environment, a goal that many cooperative space weather researchers and organisations around the world are continually striving to achieve.